Our $10.00 flat POSTAGE RATE applies to all product orders within Australia, regardless of the number of items ordered. All deliveries are by Australia Post parcel service, registered and trackable. Most orders are delivered within 2-5 working days, however this can vary in more remote areas. For Overseas orders, simply contact us with your product order and we will quote you on postage and handling costs, delivery times will be emailed to you before the actual order is sent. Once your order is placed, we will charge your credit card if you are happy with the costs. We will refund the GST portion of the order for overseas shoppers when you order is sent. N.B: * If any items ordered are not available for immediate delivery, we will contact you to discuss your options. * Urgent Deliveries - Depending on where you are located, we can offer, for an additional cost an 'Express Post' delivery option. Simply phone us and we can give you a delivery time and cost over the phone. Please make contact directly with us first if you want to return a product to us for refund or exchange to see if we can resolve any issue first. All returns can be done so through Australia Post with the postage prepaid. Simply enclose a copy of your receipt, the returning item and a brief note in a pre paid envelope, satchel or box suitable for mail or courier transport. Please address all returns to 4 Pasadena Crt Alexandra Hills QLD 4161. Items must be returned within 7days of purchase in its original packaging with your receipt. 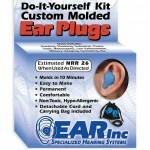 Earmold Australia® will organize a refund on Custom Earmold Earplugs within 7 days of date of purchase if on receipt the product is not damaged but does not match the product description, or is not fit for the purpose for which it was purchased. Earmold Australia® will organize a refund on Online Store items within 14 days of date of purchase if on receipt the product is not damaged but does not match the product description, or is not fit for the purpose for which it was purchased. We can process a refund whether you are in Australia or overseas. • provide a cash refund only if original payment was made by cash or cheque. Postage is not covered under our returns or warranties and needs to be prepaid by the customer. Please note - once earplugs have been in the ear they are not returnable for either refund or exchange. To complete an exchange, please write a note to us including the name, variety and cost of the new product you require. If there is a difference in the price of the products involved in the exchange, please tell us how we should refund or charge you.